Phishing scams are attempts by hackers and cybercriminals to steal personal information or hijack computing resources. Phishing scams work by pretending to be important notifications that claim something is wrong with your account that you have to take immediate action to fix. 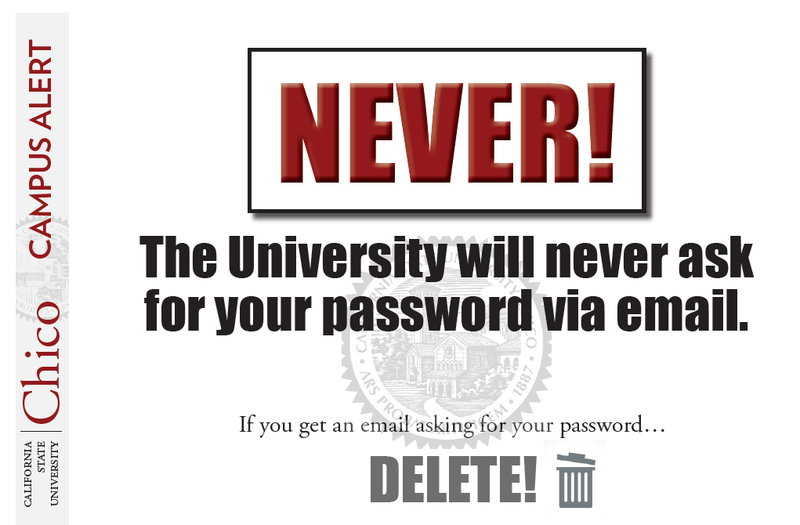 The link provided in the email is intended to trick you into entering your password or other personal information. Once you have provided this information, the attackers use your email account to send thousands of new phishing emails to other potential victims. Last semester, more than 3,000 CSU, Chico students, faculty, and staff fell victim to phishing scams. Please look very carefully at any email that is asking you to verify your account, or validate your information; it’s most likely a phishing email and should just be deleted. If an email looks suspicious, delete it. For more information about recognizing phishing scam emails check out our phishing video at www.youtube.com/watch?v=bCCA2Sy5Brk or read more about spam and phishing at www.csuchico.edu/isec/basics/spam-and-phishing.shtml. Additional voluntary Information Security awareness videos are available for all employees at www.csuchico.edu/isec/tools_resources/sans_securing_the_human_security_training.shtml.